"I think you've got it backwards, pal. First you go to law school, then you turn into a sleazebag with no regard for the truth." 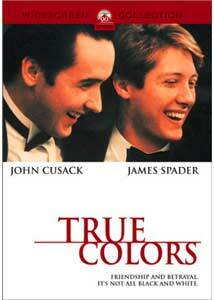 When Peter (Cusack) and Tim (Spader) meet by chance after an accident, they immediately become close friends. As the two graduate from a prestigious law school their lives take them to Washington D.C., where they ultimately become close to a senator (Widmark), while Tim begins to fall for the powerful politician's daughter (Stubbs). Life seems perfect for the friends, but there is trouble brewing beneath the surface as facts about Peter's past begin to surface and show that the now upper class congressman has in fact lied about his upbringing—and will now stop at nothing to keep his secret. True Colors deals with the sort of issues that belong in a much more deserving film. The story of deceit while climbing the social and political ladder are ripe for a hard-hitting look at the class structure that determines one's place in American society. Strangely though, True Colors seems to be about anything but this potentially fascinating premise and instead bogs down in a ludicrous love triangle, as well as a friendship that, while believable, seems to be guided a bit too much by the workings of a predictable script. I enjoyed the interaction between Peter and Tim throughout, and the film is helped by the fact that Spader and Cusack bring am unbridled energy to their roles; yet overall, the film feels flat. The relationship forged is one of screenwriting dreams; Tim and Peter will undoubtedly stand by each other until the script calls for them to become the harshest of enemies. Their fight on the ski slopes after the admission by Peter about Tim's fiancé is nicely done, but after it is over, the two immediately go back to being close friends and Tim is even the best man at Peter's wedding. The script by Working Girl author Kevin Wade never rebounds from this fault, as the final act is relies on the viewer's ability to understand the logic behind a horribly botched blackmail scheme, and Tim's efforts to put an end to Peter's power. All of this is fine, but is this what it takes to get Tim to finally take a stand against Peter's falsified past? True Colors has an ending that really doesn't make sense. Image Transfer Review: Presented in the original 1.85:1 anamorphic widescreen image, True Colors looks good for a film that is now over a decade old. Sharpness and detail are fine, though not spectacular. Colors are nicely rendered; the drab tones of Washington come off nicely on this transfer. I noticed some small print flaws as well as a surprising amount of grain in several scenes. Audio Transfer Review: Like the video, the audio portion of the disc is average at best. Dialogue is at the center of the track and sounds fine, though not spectacular. I noticed no distortion or harshness, while the surround speakers show a nice amount of activity in the early scenes involving the election night party. A Dolby Surround track is offered in both English and French, though I noticed no real difference between this track and its 5.1 counterpart. Extras Review: Fourteen chapter stops and static menu pages make up the extra features. For fans of the film, the new DVD of True Colors is a winner up until the lack of extra features. For those who have a tepid reaction to the film, a rental may be the best bet.